The University of Houston (UH) is a state research university and the flagship institution of the University of Houston System. 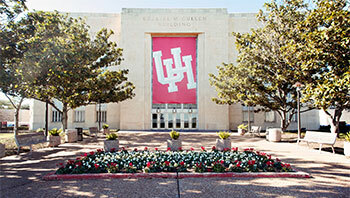 Founded in 1927, UH is the third-largest university in Texas with nearly 41,000 students. The Carnegie Foundation classifies UH as a research university with very high research activity. Today, the University of Houston is a major public research and teaching institution, serving more than 39,800 students annually with nearly 300 undergraduate and graduate programs. The Department of Earth and Atmospheric Sciences at the University of Houston has a wide range of research programs central to the earth sciences. The Department offers B.S., M.S., and Ph.D. degrees in Geology, Geophysics and Atmospheric Sciences, a B.S. in Environmental Sciences, and a B.A. in Earth Sciences. The China University of Geosciences (Wuhan) is a key national university directly under the administration of the Education Ministry of the People’s Republic of China. It is located in Wuhan, the capital of Central China’s Hubei Province. It is regarded as a top university specialized in geosciences in China and exerts considerable influence within the Chinese mining and oil industry.